Is your car overheating? Don’t wait until there’s steam coming out from under the hood. Give Pacific Automotive in San Diego a call instead. If you delay radiator repairs you could very well end up as the classic vehicle beside the road, hood up, and radiator steaming. We are close to Pacific Beach and La Jolla. Whatever your cooling system problem might be, visit us before you find yourself stranded and having to deal with whoever happens to be close by. Pacific Automotive has been around for over 20 years with ASE certified master mechanics for all your automotive needs. We’re the San Diego dealership alternative, with scheduled and repair services that maintain your manufacturer’s warranty and keep your vehicle performing reliably long after that. Our customers love our technical expertise, affordable rates, and personal attention. We guarantee your satisfaction. Our experienced and well-trained troubleshooters will identify the actual problem before we start repairs. Depending on the specific problem and the overall condition of your car or truck’s cooling system, one of several courses of action will be the most economical in the long run. Engine overheating is often caused by failing to follow the manufacturer’s maintenance recommendations. Assuming there’s enough oil in the engine, a cooling problem may be caused by the accumulation of sludge and debris inside. If that’s the case drain and flush service should take care of the problem. We’ll also do a pressure test for leaks and thoroughly inspect hoses, belts, fans, the water pump, and the thermostat so that you won’t have to come right back in. If the core (the main metal part with all those small fins) is in poor condition, it should be replaced with a new core as part of the rebuilding. We’re proud to serve San Diego’s 1.4 million citizens. 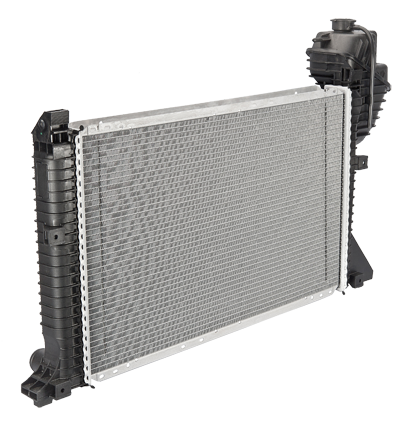 In Southern California it’s always a good idea to have your vehicle checked out, including the radiator and cooling system, before heading inland for summer travel. That’s especially true if you’re heading out to Las Vegas (332 miles) or Palm Springs (139 miles). Actually considering traffic and the climate just a few miles inland, a pre-summer check-up is a good idea regardless of vacation plans. Just the 120 mile trip up Highway 5 to Los Angeles can put quite a strain on your car or truck’s radiator.